Great for holding odd sizes and shapes. 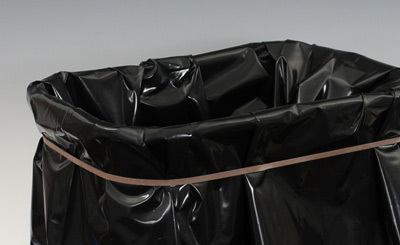 Multipurpose rubber bands can be used to secure liners to trash cans or in place of steel strapping, stretch wrap, or adhesive tape. Can also be used to stabilize loaded pallets, group items to be shipped to separate locations, and keep loads in place during transport and storage. Economical, reusable, extra-large rubber bands are made of natural rubber. Fits 55-gallon drum - stretches to 136". Approximately 225 per package.